I've come a long way since the first musical I wrote back in 1981. Since then, I've written traditional book musicals (shows with a linear plot line), concept musicals, an absurdist musical comedy, a political musical, even an educational musical about the history of astronomy (no kidding). This was the first time I've ever had a public reading and discussion of one of my shows, and it was a wonderful experience for me, for the actors, and for the audience. A big crowd showed up at our reading in February – a lot more than we expected – and their comments during the discussion afterward were for the most part intelligent and very useful. Since the reading, I've done a lot of rewriting, cutting, adding, and rearranging to strengthen the show. It's been through four versions so far, the latest of which is still being revised as I write this. For the first time, I've constructed a score in which musical themes are used to connect characters and dramatic events. For instance, the melody to the chorus of Adam's song “The River of Life” is also the melody to the bridge in Zach's “Hell,” in order to connect these two characters emotionally; and it shows up again in their Act II duet, “Alone.” A number of other musical themes are sprinkled throughout the evening to link dramatic events and reinforce important concepts (death, loneliness, etc). Most of Stephen Sondheim's scores, Andrew Lloyd Webber's earlier works, shows like Les Misérables, and a lot of operas use musical themes in this way, and it's been fascinating playing with these musical puzzle pieces to help tell this story, even if it's only on a subliminal level. I read a great quote recently, that premises belong on stage, and conclusions belong in the house. In other words, a playwright shouldn't tell his audience what to think; he should present interesting issues and ideas and let them form their own opinions. Of course, this is easier said than done, and it is asking more of an audience than the average musical theatre audience expects. But I have found that New Line's audiences enjoy a challenging theatre piece. 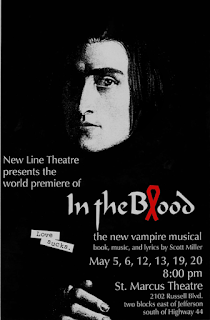 As with most of our shows, In the Blood addresses a variety of issues. I hope you find it interesting and thought-provoking, as well as a lot of fun. REMEMBERING IN THE BLOODUnintentional pauses onstage are the scariest thing an actor can encounter, and In the Blood had a classic. It was one of the last performances, the beginning of the last scene. Leo is onstage, “unconscious” in a hospital bed. Laura is standing next to the bed, but she’s losing her voice, and she’s blown it out during the performances so that she can now barely make a peep. Andy and Keith are also onstage, all of them waiting for Jim to enter. But Jim is offstage trying to make a costume change and he can’t open the fastener on his tux pants to take them off. So there they stand onstage, no one saying a thing as the audience hears the frantic jingling of Jim’s belt offstage. Neither Andy nor Keith can think of a single thing to say. There is more than a minute of dead silence – an eternity onstage. Finally Jim yells his first line from offstage. No one responds. He keeps jingling. After what seems like ten minutes but is actually only about two minutes, Jim finally makes it onstage, just in time to keep me from having a coronary embolism at the piano. After the show, we all have a good stiff drink and I tell Jim he can leave the tux pants on for the last scene.